So far this study has examined the flow of the "electric fluid," stressing aspects relevant to everyday life. But long before people knew of electrons and protons, they wondered--what did such a fluid consist of? A flow through a pipe usually consists of water, compressed air, hydraulic fluid, blood or some other fluid. What kind of material flows in an electric current? They named it electric charge. When it is not flowing, we call it "static electricity" (static = not flowing). Static electricity was already known to ancient Greek philosophers. Thales of Miletus, around 600 BC, probably knew that amber--fossilized pine-sap, a plastic-like non-conducting material--could attract light pieces of straw and feather when lightly rubbed with dry cloth or fur (most modern plastics also act that way--a plastic comb, for instance). Before discussing this further, however, it may help to examine permanent magnets, which Thales also knew and which share many of the features of static electricity. The ancient Greeks also noted that on rare occasions "lodestones" were found in nature, chunks of iron-rich ore with the puzzling ability to attract iron. Some were discovered near the city of Magnesia (now in Turkey), and from there the words "magnetism" and "magnet" entered the language. The ancient Chinese discovered lodestones independently, and in addition found that after a piece of steel was "touched to a lodestone" it became a magnet itself. Even earlier it was shown that the attractive power of any magnet seemed concentrated at two "poles" at its end. Two types of poles existed, named for their role in the compass needle--the north-seeking pole ("N" or "north" for short) and the south-seeking pole ("S" or "south"). Poles of different types were attracted, but poles of the same kind repelled each other. Gilbert noted--as we all probably do, at one time or another--that while poles of two magnets may attract or repel, ordinary iron was always attracted. He was again right in guessing the reason: ordinary iron touching the pole of a magnet became itself a temporary magnet, with (N, S) polarities that favored attraction to the magnet (see below). As long as the temporarily magnetized iron touched the magnet, it could itself attract other objects, e.g. nails, and two nails hanging from neighboring points repelled each other. Soft iron lost its temporary properties as soon as it was removed, but steel could retain them, making it useful for compass needles. One phenomenon which Gilbert found somewhat similar to magnetic attraction was the one found by Thales, that amber, glass, crystal and some other substances could attract light object when gently rubbed with cloth or fur, in a dry location. The Greek word for amber is elektron, so he named such materials "electricks" and their attraction the "electrick force." From that grew modern terms such as electricity, electric current, electrons and electronics. Gilbert studied the strange force, finding (for instance) that while a thin layer of water disrupted electric phenomena, a thin layer of oil did not. He even constructed a "versorium," a lightweight nonmetallic pivoted needle resembling a magnetic compass, which obviously inspired it. Near an electrified object that needle would point in the direction of the "electrick force"--in what today would be called the direction of the electric field. On the other hand metals, carbon and watery solutions (especially the ones that contain dissolved electrolytes such as salt) freely allow electric charge to flow from point to point and distribute itself among all the locations it can reach. Such materials are called electric conductors. If we try to charge a metal rod held in one's fingers, the charge will spread to the fingers to the body, and from there, perhaps, through the leather soles of one's shoes to the ground and to the rest of the world. No observable charge remains on the rod, so any observation will conclude that it has "drained away." However, such a rod can be charged if we insulate it from our fingers with a piece of polyethylene sheet. The process of providing a conduction path through which static electricity can escape to the ground (which has enough bulk and humidity to conduct it away) is known as grounding. (It was already mentioned earlier, as one way of increasing the safety of home wiring.) If you work with computer chips (tiny electric circuits and components, etched on silicon) you should always take care to ground your body, e.g. by first touching a grounded object (say, the wall of the room or some big metal object), before moving from your chair. For your body might carry a static electric charge--developed, say, by friction of your shirt or blouse--and when you touch the chip, some of it may jump over and damage the delicate circuitry ("zap" or "fry" the chip). The risk is particularly high in modern offices, where even in the summer air is kept dry by air conditioning, where the floor is paved with insulating tiles and the workers are likely to wear shoes with rubber soles. The amount of static charge produced by friction is very, very small--compared to, say, the charge transmitted each second by 1/1000 of an ampere ("one milliampere"). That is why even a thin layer of moisture on one's hand can discharge it. In grounding electric circuits in the home, on the other hand, a substantial copper wire is needed. Copper is the preferred conductor in commercial applications, in the wiring of homes and vehicles, and in motors. Silver is a better conductor, and gold is better still, which is why it is used (as a coating, in tiny quantities) in some precision microcircuits. Weight for weight, aluminum beats out copper, too, but (as already noted) it is rarely used in wiring, because it reacts chemically with the oxygen in air to produce a thin insulating surface layer, whose high resistance can cause local heating and even start a fire. The US treasury was not exactly enthusiastic to help, but it consented, and tons of silver were converted to insulated electrical wiring. The silver was returned to the treasury after the war and according to the story, everything was accounted for. Like the electrically polarized straw in the preceding section, a metal rod on an insulating stand will also be "polarized" by a charged object held near one end. Suppose the charged object, as before, is positive, so that negative charge is drawn to the end nearest to it. With a wire, we can now drain the positive charge from the other end (drawing). If that wire is disconnected while the charged object is still in place, the metal rod remains with a net negative charge, and will stay negatively charged even after the original positive charge which caused the polarization is removed. In demonstrations of static electricity, metal objects are often charged this way. The electric charge of lightning is apparently created by friction of frozen raindrops (like hailstones) blown upwards by updrafts in thunderclouds, encountering other such hailstones falling back down. More is given at the end of the section on the Van de Graaff voltage generator. Military engineers in 18th century France (and later) were well trained in science and made many important contributions to it. In his official capacity Coulomb supervised the building of fortifications on the Caribbean island of Martinique, and later in France the construction and maintenance of canals, ports and of the royal waterworks which fed the exquisite gardens of Versailles. He also conducted scientific studies of sliding friction, discovering that besides depending on the nature sliding surfaces, it was approximately proportional to the force holding them together, regardless of the contact area--e.g. when a brick-shaped block of wood was dragged along a flat horizontal surface, the force of friction was approximately the same no matter which side it rested on. By 1773 it was well known that the direction of the compass needle underwent a regular 24-hour cycle, a tiny variation just barely observable even with oversized compass needles. The Paris Academy of Sciences therefore offered a prize for the most sensitive compass instrument, which might perhaps help investigate this phenomenon. The prize was awarded in 1777 and part of it went to Coulomb who studied the variation with a magnetic needle suspended by its middle from a long silk thread inside a glass container (see Figure) . Coulomb's instrument, however, could do much more. It became known as a torsion balance--torsion is the twisting force of a string (here the one of the suspension), which is balanced against some other force. The string hung from a knob which could be turned, and the size of the force could be deduced from the angle be which the string had to be turned to bring the needle back to its first position. This formula was the beginning of electricity as an exact science! Coulomb also proved that attraction varied inversely with the square of distance, a more difficult experiment, and that magnetic poles obeyed a similar law. He described his results in 6 reports published in 1785-90. Coulomb's method was adapted by Henry Cavendish in Britain to the laboratory measurement of gravity. That is a much more difficult observation, because the attraction between to spheres is much, much weaker than the electric or magnetic forces measured by Coulomb. Also, because the spheres are massive, the motion of the suspended pair of spheres is quite slow. 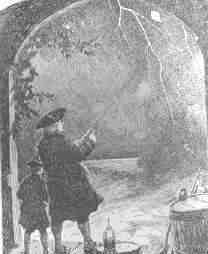 Nevertheless, by 1796 Cavendish performed that experiment and showed that the pull of gravity between two masses varied like 1/r2, not just between planets and moons (as Newton had shown) but also between masses in the laboratory. An electrically charged object--an insulator or an insulated conductor--can ordinarily hold only a small amount of electric charge. Adding more charge quickly causes the voltage to rise--and since the object can usually receive charge only from a higher voltage, it becomes increasingly harder to add much more. However, after 1745, in the Dutch city of Leyden, a neat way for storing much more of it was found by E.G. von Kleist and Petrus Van Musschebroek . Capacitors will never displace storage batteries: the amount of electric energy they can store is much, much less. Their advantage is that they can deliver their energy very quickly--in a flash, you might say. In fact, one of their uses is powering electronic flash units in photography. In such a unit a capacitor is discharged through the circuit of a special lamp, producing a short but intense flash of light. Since half the wavelength (the dotted part) is blocked, the wave now consists of one-sided "teeth" (graph). That may not matter when one charges a storage battery, but a radio, for instance, needs a smooth voltage; one that is interrupted 60 times each second will, at the very least, emit a 60-cycle hum. Now suppose the voltage source is not a battery but an alternating voltage--especially, one with frequency much higher than 60 cycles, e.g. a radio signal, or the voltage which drives the loudspeaker as music is played. Now the voltage on one plate will constantly go up and down, and since the other plate tries to follow, a constant AC current will circulate, charging and discharging the capacitor plates. In other words--a capacitor will transmit alternating current (AC) but will block DC. It is not a "short circuit" allowing all AC to pass, but offers a sort of resistance (the name is "impedance") which limits its AC current, just as resistance limits currents of any kind, and it also shifts the peak of the wave. The higher the frequency, the smaller the impedance, which means, the more easily does the AC current flow across the capacitor. Unlike flow through a resistance, here electric energy is not lost and there is no heating. At the input side, there may also be an "isolation transformer" which receives 110 volts AC and also given 110 volts AC in its output circuit, but with no connection to the "ground" of the power cord. Because the two are not connected, someone touching the inside circuit cannot conduct current to the (real) ground. Appliances which are completely encased in insulating plastic sometimes save cost by omitting such isolation, they just warn not to work on the circuit when the power is connected. The property of capacitors to transmit rapidly varying signals can be useful or problematic. depending on circumstances. The voltages at any point of the circuit--in particular, the input and output points--therefore have two parts. First, there is a constant voltage, defined (in the simplest case) by Ohm's law and by the resistances feeding current into the point and out of it. And second, added to this is the signal, a rapidly varying voltage, tracking (in this example) the pressure on the microphone from the sound being amplified. When the output voltage of one stage is to be transmitted to the next, we want to pass along the signal, but not the constant part, which would affect the operating point of the next stage. How can one separate the two? Simply! Insert a capacitor in the connection that carries the output to the next stage: the signal passes through, the direct voltage does not. Where it is a nuisance: Have you ever experienced crosstalk on a telephone? As you speak to the party at the other end, some unrelated conversation is added to the sound, interfering with your connection. The reason could be that wires of different telephone circuits run along each other, and the capacitance between them is large enough to transmit an echo of its own conversation to its neighbor. To prevent such "signal pick-up" between different sections of a computer or a TV receiver, they are often enclosed in separate grounded metal boxes, which don't let the signal through. "Touch pads" which trigger a device when you place your finger on them, work through the extra capacitance between them and your finger, which unbalances a delicate circuit. Some metal detectors use a similar principle. In the era of vacuum tubes, radio and TV circuits included large components, including the tubes themselves. Capacitance between large objects is also larger, so unwanted "stray capacitance" (e.g. between parts of the vacuum tube) hampered operation at high frequencies. Today's computers, using etched silicone chips, can work at much, much greater speed, because the dimensions of circuit components are very small, greatly reducing stray capacitances between different parts. A Scottish scientist at the University of Glasgow, William Thomson, found a way to speed up operations and was well rewarded for it--also, he was honored as Lord Kelvin (after a stream in Glasgow) and after his work on heat, his title became associated with the absolute scale of temperature. Later cables also included "repeater amplifiers" along their length. As already noted, even large capacitors cannot store much electric charge. A 110-watt lightbulb draws about 0.9 amperes, i.e. a charge of 0.9 coulomb per second: to store even 1% of this charge, a rather large capacitor is needed. Compare this to a car battery, whose specifications typically promise of the order of 100 ampere-hours! Still, storage of charge implies the storage of electrical energy. A storage battery, in contrast, stores chemical energy, which can be converted to electrical as the need arises: it is not the same thing. A capacitor delivers all its energy much more rapidly. The unit of capacitance is named farad, after Michael Faraday, whose work will be described in a later section. A capacitor of 1 Farad charged to 1 volt holds 1 coulomb--when charged to 20 volts, 20 coulombs, etc. You are not likely to see capacitors that big: practical units are more likely to be rated in microfarads, millionths of a farad, or even picofarads, millionths of a microfarad. The notation for such quantities usually uses the letter mu, the lower-case Greek "m", written μ and used as an abbreviation for "micro" (Greek "small"), a prefix meaning "a millionth." A microfarad is then abbreviated μf, a picofarad pf or μμf. The DC power supply of an old-style radio receiver may have a 5-50 μf capacitor, while the circuitry itself may have component capacitors of 500 μμf or smaller. Radio frequency is quite high, so even a small capacitor is not much of an obstacle. With the help of a capacitor a very simple flashing light may be constructed, based on the neon light, a small lightbulb filled with low-pressure neon gas. The light of a neon light, like that a fluorescent light fixture, is produced by an electric current flowing across the gas-filled gap, carried by a plasma, a gas in which some electrons (at least) are detached from their atoms (which are left with positive charges). The voltage across the gap accelerates some electrons, which then can "ionize" some more atoms (separating electrons from them) and increase the current. Ultimately however they are recaptured, while other electrons are "bumped up to a higher energy level" of their atom. When they return to the lowest "ground level" of energy (in a fraction of a millionth of a second, usually), or are recaptured, they give up their extra energy as light. However, once a certain threshold value is passed--depends on the device, but 70 volt is typical--colliding electrons free up additional electrons, and the whole process becomes an unstable "avalanche." The neon tube is a "greedy conductor," drawing more and more electrons until some limit is passed--e.g. it gives one very bright flash and then stops working altogether. This can be prevented by placing a large resistance--say, 10 million ohms--in the circuit of the lightbulb, which limits the current to microamperes, still enough to produce visible light. Lamps with such resistance built-in and two insulated probe wires sticking out are sold as neon tube testers, to safely check whether a circuit is "live" (connected to the power) or "dead." You can stick both wires into an electric outlet and see if the lamp lights up--or you can insert one wire into the "outlet and hold the other in your finger, to tell which side of the outlet is "ground" and which side is "hot." If connected to the "hot" side the lamp lights up, and while an electric current then flows through your fingers, it is so small you will not notice it. A crude oscillating circuit can be made by connecting a capacitor in parallel with the lamp, one side branching off from each side of the lamp, and with a large resistor limiting the current (see illustration, but obtain the neon lamp separately--the one in the neon tester also has a big resistance built-in). The instant the circuit is connected to a source of DC voltage--say, 100 volts--a current will flow through the resistor to the branch-off points. Initially, the capacitor will grab it all and the light will not flash. Once the capacitor is charged to (say) 70 volts, a discharge begins, and very rapidly removes charge from the capacitor through the lamp. Soon, however (say, when the capacitor voltage falls to 60 volts), the lamp goes out and the charging resumes. Thus the lamp will oscillate between 60 and 70 volts. The wave form is very similar to a sawtooth: when the discharge starts, a rapid "avalanche" of current very quickly drains charge down to the cut-off (say, 60 v) and creates a flash of light. Then, however, the current stops while the capacitor charges back to the "ignition voltage" and the process repeats, again and again. The stored electrical energy has also increased 10-fold! Have we perhaps discovered a source of boundless electrical energy? No such luck! Energy must still be conserved, "there is no such thing as a free lunch". Since the two plates carry charges of opposite sign, they attract each other, and when pulling them apart, we must overcome that attraction. That means we must perform mechanical work, and invest energy from some other source. It all balances, and putting a dielectric layer in between only increases the effect, because the initial electric charge can be larger. The device consisted of two round conducting plates of the same size, insulated from their surroundings and separated by a thin insulator. The lower one lay on a table (insulated from it) and the top one had an insulating handle, by which it could be placed above the bottom plate, separated by insulator. The name "electrophorus" means carrier of electricity, which was the purpose of the apparatus. Say you have an insulated metal ball you want to charge electrically (balls and gradually rounded objects work best in keeping charge from escaping, whereas sharp points build up the local electric force and tend to leak charge). You can charge it by touching it with some charged object with an insulating handle; but after you have done so, what next? The ball is charged and you can only add charge from an object with higher voltage. A fluid flows only from high pressure to lower one, and electricity acts that way, too. With an electrophorus, however, you can charge it again and again. We do best without the frame and screw: just two plates, separated by some dielectric insulator, with an insulating handle. Charge the top plate by friction, then put it on top of the bottom one, which is insulated. Ground the bottom plate for an instant, so that (see first illustration in #15 on static electricity) the two plates have equal and opposite charges. Remove the grounding connection and then quickly pull away the top and touch it to the ball. Pulling away increased the voltage and the electric energy by a large factor, and most of the charge will go to the ball. You can repeat the process again and again: it will only slow down when the voltage of the ball approaches the one of the lifted electrophorus. As a fun experiment, I once constructed an electrophorus using kitchen equipment and a neon lamp (also wires and alligator clips, though bare paper clips might also work). It raised the voltage of an electric cell (1.5 volt) sufficiently to cause the neon lamp to blink, although that only happens with voltages around 70v. In the kitchen you can find good insulators (polyethylene bags and saran wrap) and good conductors (aluminum foil), and the lifted plate was a large frying pan. You can read about it here. If you can get a bare neon bulb (instead of one protected by a resistance) you will probably get a much brighter flash. Similarly, when a xerographic copier ("xerox machine") is used for copying printed material onto transparent acetate sheets used by projectors, such sheets get charged electrically by the printing process. If you stack them as they come out of the machine, they will cling together, and the static cling only gets worse if you pry them apart, because again, you are raising the voltage. Much better to lay them down separately as they come out, letting them cool off and letting the charge leak away, bringing them together only afterwards. A little further in the rotation, the pattern to be printed is projected onto the disk, either from a light that scans the document to be copied or (in a laser printer) from a computer-controlled laser (or else, from an array of light-emitting diodes). The light removes the charge from all areas expected to remain white. The drum continues to turn to where its dark parts, still charged, attract particles of a fine carbon powder. Then a bit further still, that powder is deposited on paper, and a heating element melts some glue-like material ("fuser") in the powder, causing it to stick to the page.